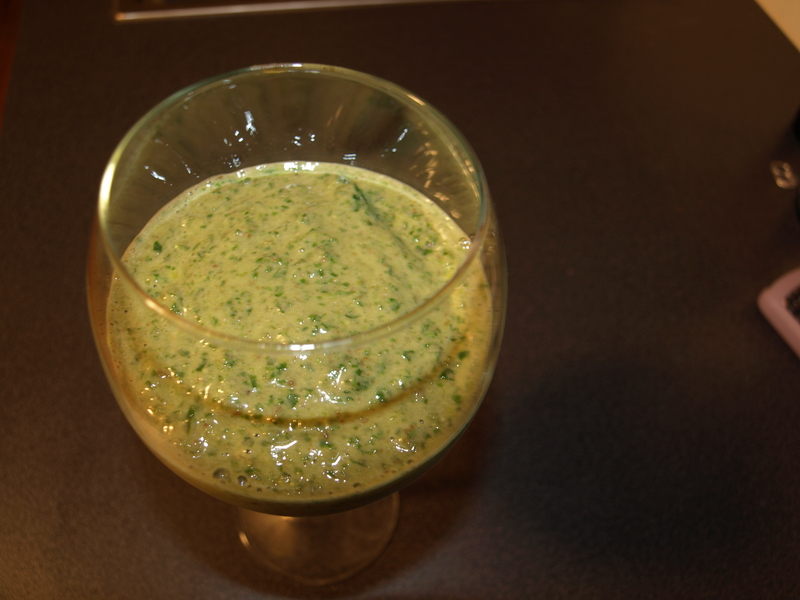 Soups, green monsters, smoothies, natural sugar-free ice cream, spreads, butters, and more…she does it all! P.S. Thanks for giving in, BF! Blogging Hiatus OR Deep in the Caves of Exploration?!? It’s been a while since I last blogged, but with good reason! I’ve been consumed by reading! My web searches are endless – one page links to another to another and I’m excitedly absorbing all I can so that I can put together a post about what it all means! 🙂 As if I could summarize all I learned in one post! But, I want to put together a mission post, as such, to help me define what I’m looking for, what I believe is important in eco-friendly and sustainable goods and services, and who the experts are. I want to know what’s been done, who’s done it, and what the future is of this knowledge pool and certification process. What do you look for when buying products? My morning routine usually starts at 6:06am. I have always had to eat first thing when I get up. My go-to breakfasts have been green monsters (thank you, Oh She Glows for the inspiration), or the non-blended version of a green monster minus the green – in other words, fruit with flax and nut butter on top. YUM-YUM-YUM! Mango-Banana-Lime-Kale GM - TASTES LIKE HEAVEN!! I’m telling you, this tastes like tropical heaven!! I’ve been dreaming of making my GMs with a shiny new Vita-mix (could be possible with the Vitameata Vita-mix giveaway courtesy of Chocolate-Covered Katie), oh my, the possibilities of glorious GMs, amongst other things, are endless!! I take MR out for a morning walk, and come back to finish my preparations before beginning my commute to work. Each day, I prepare a cup of ‘Joe’ to take with me to work. The sound of the kettle whistling is such a comforting sound – the sound reminds me of the comforting cups of tea and coffee enjoyed with friends and family, by a warm fire inside on a cold winter day, during my time in university, during my time working at a café, and the different kinds I’ve had the pleasure of tasting in different parts of the world. I really love the ability to select my coffee of choice. I enjoy watching the water absorb the colour of the coffee grinds and warming up my rice “milk” to match the heat of my coffee (I like my hot drinks HOT!). The sweet aroma always offers me the final wake up nudge to head out the door. This cup of “Joe” serves an important task – it is an inspiration for me to get to work, and to get settled at my desk to open up my thermos. I used a thermos, loyally, until it met its last days last week. And, I immediately looked online to see what could serve as its successor. I knew exactly where to look and I was NOT disappointed! Using materials bought from a hardware store in Chico, California, the Kleen Kanteen prototype was born. A stainless steel sustainable alternative to the Bisphenol-A (BPA) ridden, disposable, plastic water bottles. BPA has been found to seep out of many plastic products, and ends up in the water, coffee, or food we ingest out of those plastic products. These BPAs are one of many substances, known as “endocrine disruptors,” which raises many questions about health effects and risks. Some concerns surround the effects of BPA on brain, behavious, and prostrate gland function in fetuses, infants, and children at current human exposures as well as questions about the effects on the mammary gland, and an earlier influx of puberty for females (source). There was actually a BPA research project launched to investigate the impacts of BPA on humans, the safe levels of exposure, as well as recommendations and policies regarding disclosure. Kleen Kanteen first produced food-grade stainless steel, BPA- and toxic-free water bottles, available in many different sizes and colours. These bottles don’t need to be lined with anything to protect the metal! They are super easy to clean, and there are NO FUNKY SMELLS because the steel doesn’t absorb any flavour or smell residue (like their plastic counterparts!! They even have infant “sippy” versions. How cool is that? I own TWO Kleen Kanteens water bottles and have used them for all my cold drink transportation needs. Their new Kleen Kanteen Insulated is the perfect F1 (first filial) generation to the parent models, the plastic water bottle replacements. The insulated model is thicker and so…no more hand scalding!! What also makes me happy? Knowing that the product I just bought makes sure to minimize the packaging of it’s products, and if they do use boxes, etc, they come from post-consumer waste or are made from materials certified by the Forest Stewardship Council (FSC). All labels on the bottles, in-store displays, etc are made from FSC-wood and use low-VOC, water-based stains. I also know, that unlike plastic water bottles which end up in landfills, if I no longer want my Kleen Kanteen, I can be assured that the stainless steel doesn’t downcycle – meaning it can be recycled into a product with the same quality of stainless steel. But, come on, why wouldn’t I want it??! I also like seeing that while Kleen Kanteen does a lot to make sure it is making significant progress in reducing the waste of plastic bottles, supporting the awareness of BPA-free products and research of health risks, as well as offsetting its environmental impacts, the company is well aware of the need to continue looking into ways to be environmentally and socially smarter about their own practices. Kleen Kanteen have offset the electricity they use at their Chico, California distributing facilities and offices since 2008 and are looking into the potential of using solar technology to generate the electricity for their facilities. They are taking action with respect to assessing their sourcing, materials and shipping in order to make changes to become more knowledgeable and resourceful with respect to material origins and product production, safe (health and quality control), and abide by environmental and social (including employee rights, safe working conditions, fair labour, etc) standards and policies. Furthermore, as a member of 1% For the Planet, Kleen Kanteen looks to support like-minded organizations. 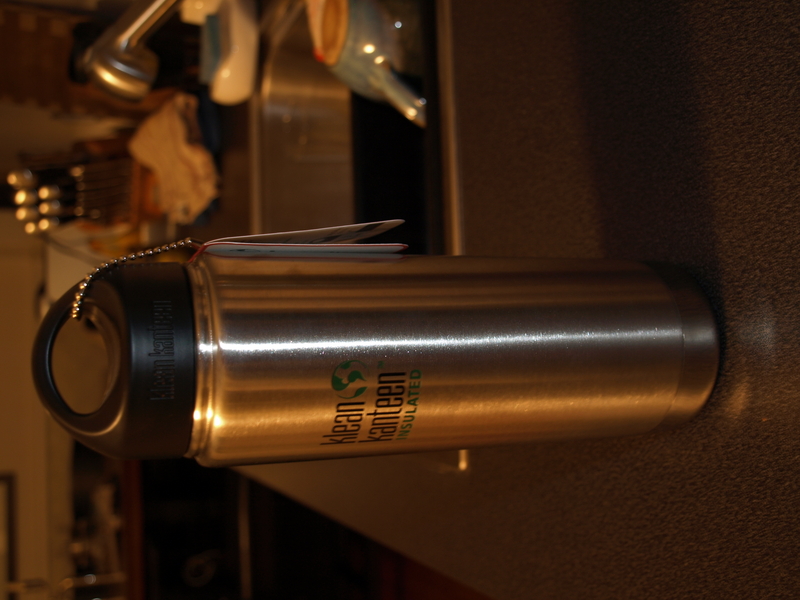 Thanks Kleen Kanteen – I love my new KK Insulated!! In my former life (or so it seems), I drank cow’s milk, ate cottage cheese, and enjoyed A LOT of yogurt. Once my stomach ailments took over my life and I set upon changing my diet with the advice of a couple of naturopathic doctors, my choices seemed to open up before my very eyes. The elimination of dairy and other foods from my diet was not due to a so-called “intolerance,” but more of “insensitivities.” I know when I eat something that contains the trigger foods as I become bloated, gassy, uncomfortable, nauseous, and can have stomach-aches. For the most part, gone are the days of such terrible stomach and pains that I couldn’t stand. I used to curl up in the fetal position in bed and wince with pain. The change of diet introduced me beyond the standard soy milk alternative to dairy to rice, hemp, quinoa, oat, and almond milks. Pretty much any grain or nut can be made into a “milk.” Each can be used in hot or cold drinks, with cereals, in baked goods, as bases for soups, and I’ve even made “yogurts” out of them with great success. A few companies make and sell “milks.” I took some time to look into the differences between the ingredients and am always drawn back to Natur-a Rice Milk. Not only is this product dairy-free, but it is also gluten-free! 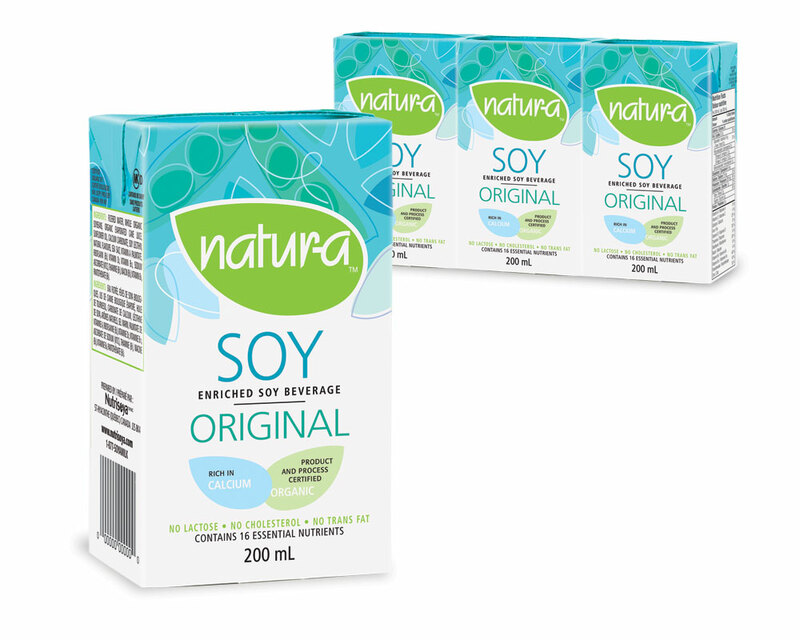 Made in Saint-Hyacinthe, Quebec, Nutrisoya Foods Inc. focuses on using independent third-party certified organic resources to make its products. Under the accreditations, 95% or the ingredients must be certified organic, as does the manufacturing facility, and both the manufacturing and packaging processes must be organic as well. They describe these, proudly and transparently on their website, here. They use locally grown (from Ontario and Quebec farms), certified organic, non-genetically modified organisms, and are certified kosher, thereby meeting very high standards of hygiene and quality control. They also claim to focus on recycling their waste by-products, I’m interested to learn what exactly they have as waste, and furthermore what they do with it!! Filtered water, organic brown rice, organic expeller pressed canola oil, tricalcium phosphate, natural flavour, sea salt, vitamin A palmitat, vitamin B2 (riboflavin), vitamin D2, vitamin B12, zinc gluconate. I particularly like the vanilla flavoured one – only difference is the addition of natural vanilla flavour! The soy “milks” are also very good alternatives. While I cannot tolerate soy very often, I have tried these and they are also tasty. There is organic evaporated cane juice in most, except the unsweetened variety, however, this is not as processed as cane sugars. They also use whole soybeans, not soy concentrates or soy isolates. The last reason I choose these soy milks over others is there is NO CARRAGEEN! Carrageen is an extract of seaweed, which is used to thicken substances and reinforce the gluten structures. It is what stabilizes liquids which are not homogeous, but rather have particles in them, so that the particles stay suspended in the liquid rather than sinking to the bottom. It can also be used to clarify liquids, if the opposite intention is preferred, for example with wines, beers, and vinegars. The problem is…there have been claims suggesting that it causes stomach aches in some people. I know for myself, I do have reactions to some soy “milks” more than others. Could this be the reason, maybe?! Nutrisoya Foods Inc., I’m a loyal fan – thank you for your wonderful products!! 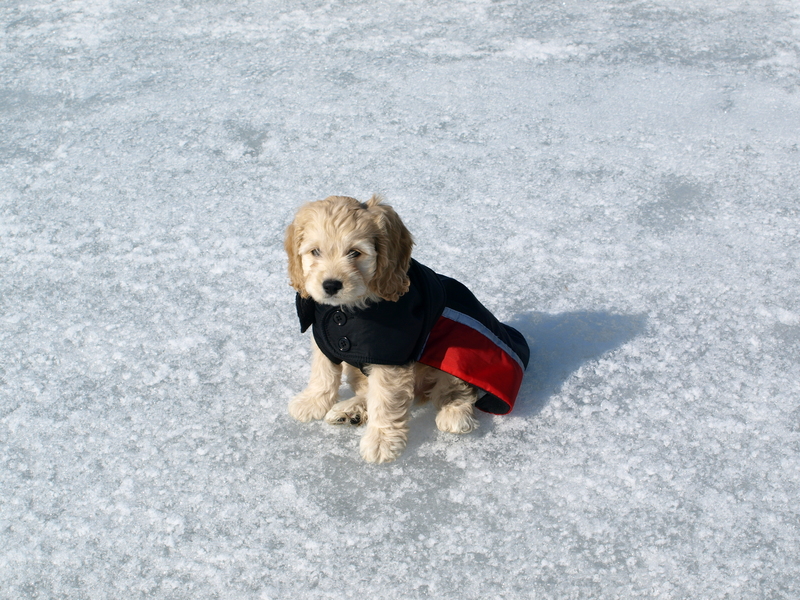 January 6, 2009, our little furry cockapoo was born…he came into our lives March 8, 2009 in a comical way and has forever changed our lives. The story goes that March 10, 2009, a day forever imprinted in my memory, as the day of my Master’s defence. In light of such an occasion it was important to boost my confidence by reviewing notes and analyses, preparing my presentation, practicing it, anticipating questions and the answers, and maintaining a state of calm during the stress. And so, off we went on Saturday morning to get myself a new shirt and get my mind off my preparations for a couple of hours. Well, needless to say, I didn’t get a new shirt, but we did get our new friend and one of the biggest comforts and provider of laughs of my life!! Riley, aka MR (Monster Riley), entered our lives and on the 6th, aka Wednesday, he celebrated his birthday as any puppy should – spoiled by his loving parents!! I shredded the carrots by hand and mixed them the mashed banana and the rest of the wet ingredients. In a separate bowl, I combined all the dry ingredients and added the wet to the dry until thoroughly combined. I only had one 12-muffin tray and so I used a loaf pan to bake a puploaf with the remaining batter. They took about 40 minutes to bake at 350 degrees, and while they baked I made the icing. I mixed all together and spread on pupcakes and puploaf once they had cooled completely. 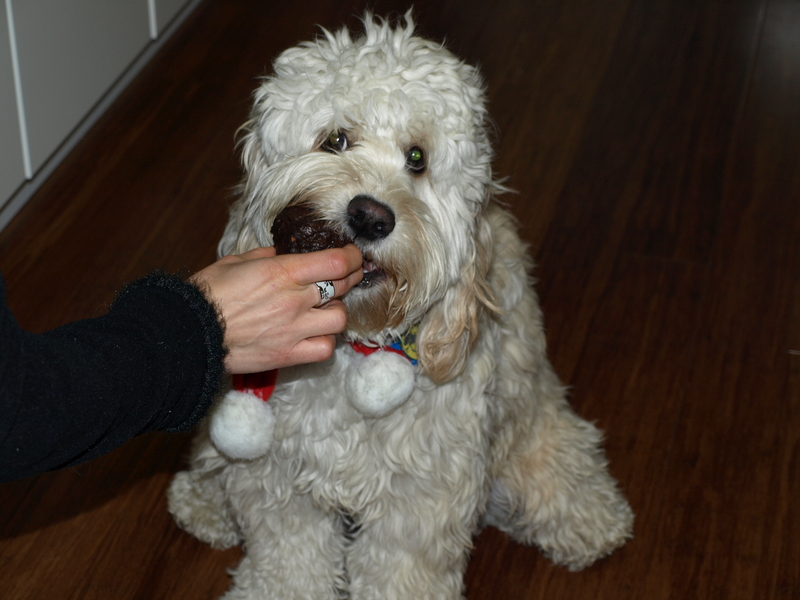 MR eating his first birthday pupcake...one more was gobbled up soon after! 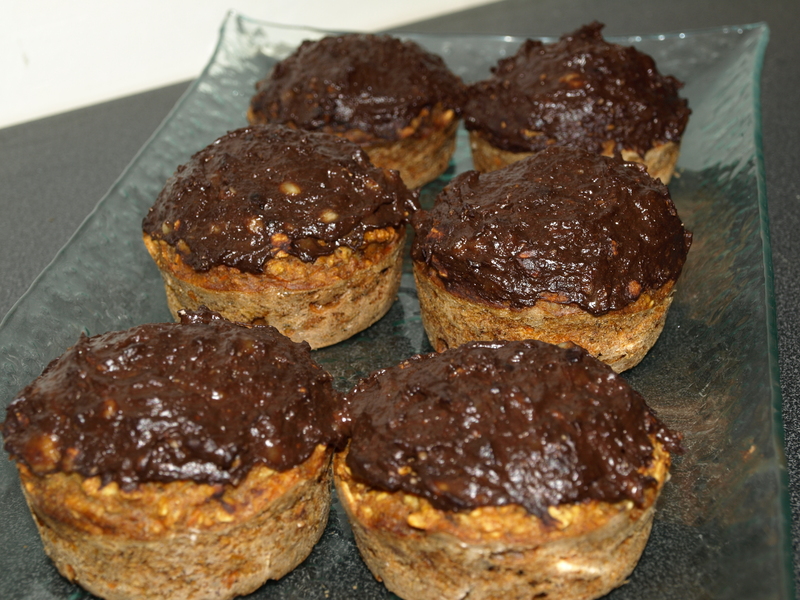 While MR adored these, next time I’m going to switch the egg for flax in order to make it a little healthier – only the best for the little guy. We also bought him a couple of toys – which, in true MR fashion he destroyed in 5 minutes flat! A special card accompanied his present. I owe it to a good friend who spotted this on a girl’s day outing! 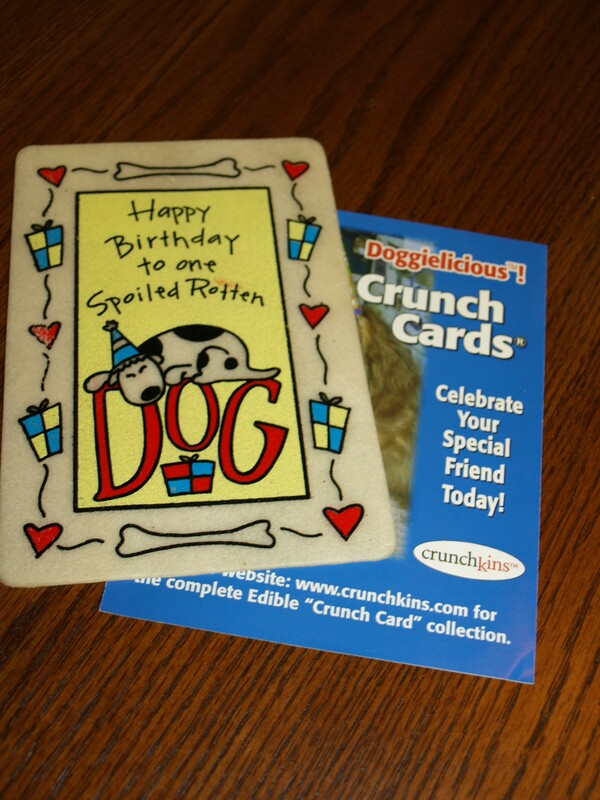 Crunchkins is the only patented line of edible greeting cards for pets – yes, there are cards for cats too. While the dog cards are 100% rawhide with non-toxic ink, the kitty cards are paper cards with a hand-sewn catnip toy attached with non-toxic glue to the card. I know that there are some debates about whether or not rawhide is good for dogs, but our vet told us that as long as the rawhide is in a shape which cannot split (i.e., is flat) it is OK for an occasional treat. MR gnawed o his crunch card throughout the night and even brought it with him to bed! He was one happy (and spoiled) birthday pup! I’m a 20-something living in Toronto. I have a conservation/ecology undergraduate and master’s degree, yet I’ve always been drawn to matters of health and fitness. I am active – I do yoga, kickbox, swim, circuit train, and walk/bike/rollerblade whenever I get the opportunity. I try to be mindful of what I eat – I’ve struggled with gastrointestinal problems for a number of years. Was it caused by all the undue stress on my body? Is it environmental triggers? 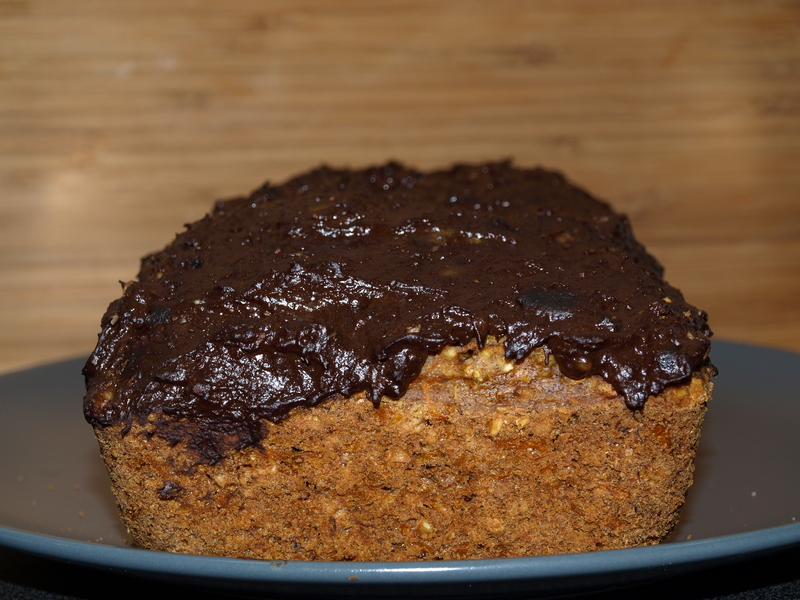 My life turned around when I was ‘diagnosed’ with Irritable Bowel Syndrome (IBS) and started investigating the alternatives to “normal” foods. Wheat, gluten, dairy, soy, sugar, and eggs were found to be exaggerators of my symptoms, and as a vegetarian, I was already restricted in my choices. With time, I feel like I have opened up more food options than I closed. So, I am a dairy-free, gluten-free, egg-free, sugar-free, soy-free vegetarian. Especially with my IBS, I want to make sure that what I put into my body is “pure”. I find this very difficult with the influx of media claims of environmental/eco-friendly/organic/local products, when I believe many are simply mechanisms to increase sales. The number of times I have walked into a grocery store, drug store, clothing store and wondered, “What am I really putting into my body or putting on my body? How were the resources to make these products extracted or produced? – Are they natural or synthetic, were they sustainable developed or did the manufacturing process causes irreparable damage to our natural ecosystems? How were these products transported to the places we buy them? Are they considered organic? Eco-friendly? Fair trade? Sustainable? How is this determined and what allows companies to stamp the labels on their products? Yes, I am one of “those” that stands in the supermarket aisle reading the labels of each product I put in my cart! And, even so, I still feel I don’t know the background of what I buy. I’m hoping that this blog is an avenue to explore the transformation of my life where a veil to one where I can see clearly. I want to be an informed buyer, and I hope by reading this blog, so do you.